Each URL that you enter will add to the search query using the “inurl” syntax. What this means is that your search results will be scoped to include only those pages that have that text in their URL. In the example above, the search will only return results from the LIS website, the LIS wiki, and the LIS blog. This would leave out the Library, Helpdesk, and Curricular Technology site, so a real example would include those URLs as well. You don’t have to use the full URL either. 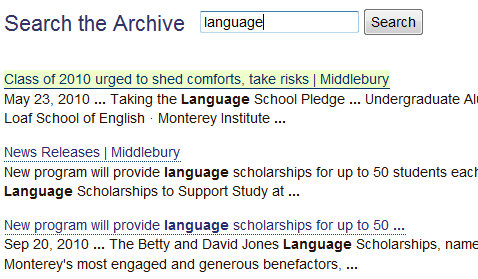 You can use a domain, like www.middlebury.edu, to limit search results to just our main website. Or you can use a word, like “fellowships” which will include results from any page with that word in its URL. The search form that a person visiting your site sees in compact and displays up to eight results as they type their search query, like the new Google Instant search does on Google’s website. Try it out on our News Archives site. Feedback is welcome, so let me know if you have any questions about this or suggestions for improving this service. This entry was posted in LIS Staff Interest and tagged Areas and Workgroups, content managers, Enterprise Applications, google, search, website on September 29, 2010 by Ian McBride. Thanks for the feedback, Jeff. The limited results are caused by what most hope is a bug on Google’s end when performing searches against their remote search API using the site: and inurl: filters (http://code.google.com/p/google-ajax-apis/issues/detail?id=27#c18). I’ll keep an eye on the progress of this issue and I’ll add in a note today letting people know when the search results no results. Will this also search the wiki? Yes. 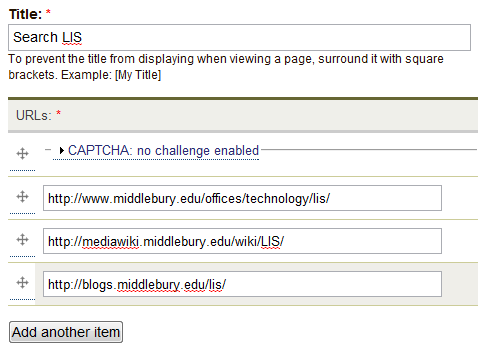 You can add “http://mediawiki.middlebury.edu/wiki/LIS/” as one of the URLs to include pages from the LIS wiki in the results.